After living with the Polk Audio Monitor 55Ts for a few months, I decided that I finally have enough experience with them to write an adequate review. Reviewing speakers for me is tough; sound is more of an art than a science, and I often find that my tastes change as I grow accustomed to a particular sound. Because of this, I took copious notes when the 55Ts were first delivered and I will attempt to balance my early notes with my current thoughts. Let’s dive in! First, my setup. I have the 55Ts flanking my 50” plasma TV with 9’6” distance between the speakers and a normal listening distance of 10’. The room itself is medium-sized, approximately measuring 27’ long x 15’ wide x 8’ tall (ceiling). The Monitor 55Ts are powered by a Yamaha Natural Sound RX-V2400 receiver (read the Sound & Vision review), rated at 120 watts RMS per channel. I am using my computer equipped with an optical audio output to feed the Yamaha a 192kHz/24 bit audio source. All test songs were encoded using FLAC and played back using Winamp 5.x unless otherwise noted. Nearfield tests with the Paradigm Atoms (about to be discussed) were done using a 30+ year old MCS 3226 receiver, rated at 26 watts per channel and fed by an analog source. I have extensive experience with both the MCS and the Yamaha, and feel the Yamaha has a slightly lower noise floor but sounds more sterile to me. I had to make due with the speakers I had for the comparison. My primary, and all time favorite music speakers, are the venerable Paradigm Atom V1s. These are 5 ¼” two-way bookshelf speakers that are best for nearfield listening in smaller rooms at moderate volumes. Clearly they are not intended for the same use as the Monitor 55Ts so bear that in mind. Both sets of speakers were tested both with and without an Energy E:XL-S8 8″ Subwoofer that is too small for the test room, but otherwise sounds great in a smaller environment. I’m looking into larger subwoofers and will add an addendum to this review when I purchased one. Finally, I threw my Audio-Technica ATH-A900 headphones into the mix as a reference. The Polk Audio Monitor 55Ts are not expensive speakers and I was pleasantly surprised when I opened the box. Fit and finish looks very good and they have a nice feel to them. The veneered medium density fiberboard (MDF) cabinets are finely crafted. The back is equipped with two sets of gold-plated binding posts, capable of being used with banana plugs or with bare wire. The 55Ts are capable of being bi-amped and are shipped with a gold-plated bridge that is easily removable. Of the three sets of comparison speakers, the Polk’s have by-far the best bindings. On the front, the 55Ts have removable speaker grills. They look nice and do the job, but I found them to be cheaply made and flimsy. In fact, some of the hard plastic that forms the shape of the grill cracked as I carefully (and I do stress carefully) removed the grills for the first time. Thankfully the damage is hidden, but it would be nice for Polk to include sturdier grills. 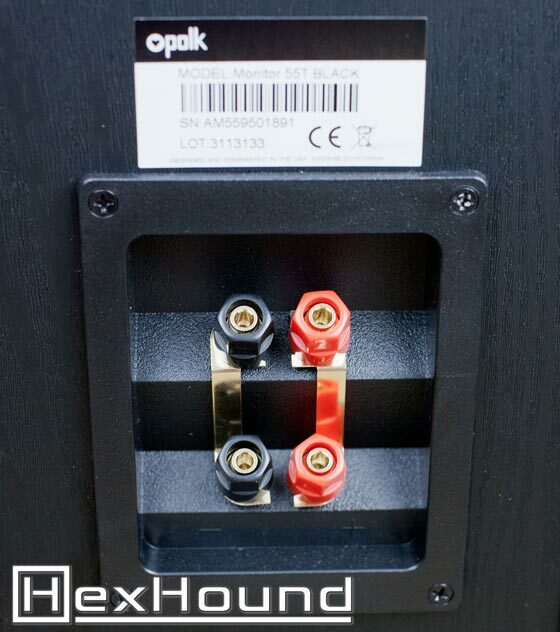 We are able to view the two 5 ¼” midrange speakers, the 1” silk/polymer composite dome tweeters, and the front port. The speakers and port are nicely inset into the cabinet. Overall, the Monitor 55Ts are very nicely built for such a low priced speaker. Without going into any specifics, I find the Paradigm Atoms to sound more natural than the Polk Audio Monitor 55Ts when listening to music, particularly classical music. The Atoms tend to roll off highs in a very graceful way that just sounds “right” whereas the Monitor 55Ts sound overly bright, almost shrill at times. I’d like to take this time to mention that I played trumpet and french horn throughout grade school and have a pretty good idea of what instruments sound like in person. When listening to music through the Atoms, I can close my eyes and I’m there; however, with the Monitor 55Ts , they always sound artificial to me. Home theater is a different story; here the Monitor 55Ts sound brilliant – voices are clear, presentation is good, and the lower base extension is noticeable. The analytical sound signature of the 55Ts seems to work. The 55Ts make very good front home theater speakers on a budget while the Atoms are best relegated to the rear. I auditioned music from genres encompassing classical to electronica to progressive rock. Some pieces include Johan de Meij’s Symphony No. 1 , Tangerine Dreams’s Tangram , assorted selections from Shiny Toy Guns , several Philip Glass pieces including Koyaanisqati and Orion , and the Deaf Scene’s Gentle Juggernaut. While listening to classic musical, I consistently found the Atoms to provide a more personal listening experience. The flute in Orion’s India , for instance, is easily localized and sounds real. The best way to describe the listening experience provided by the Atom’s is to say it’s like having a front row seat (without the bass). In contrast, the Monitor 55Ts sound overly bright, almost shrill, and struggle to accurately place instruments. Sit close to the 55Ts and it almost sounds like you cut the flute in half; sit further back and the imaging improves, but the Monitor 55Ts remain distant and veiled. To my ears, it sounds like listening to a band from the back of a large music hall. I noticed that sounds never seem to originate from outside of the 55Ts span, while the Atoms sound infinitely wide and totally transparent. I can always hear where the 55Ts are sitting, but the Atoms disappear when I close my eyes. These observations were all recorded in the mid-size room mentioned under the setup heading. To make matters worse, the harsh tweeters of the Polk Audio Monitor 55Ts only get more harsh as the listening distance decreases. I have carpeted floors and my listening area terminates at a cloth couch and a coffee table with cloth cushions – all of which temper the harsh highs, but not enough. In contrast, the Atoms were made for nearfield listening. While they perform acceptably in the same position as the 55Ts , they really open up in a smaller room and at shorter listening distances. In nearfield listening, the Atoms’ bass presence increases substantially and the rolled off highs only sweeten. Vocals shine and sound lifelike, and chimes sparkle; I only wish I could say the same about the 55Ts . Perhaps the Polks truly live up to their “Monitor” name; they are far more revealing than the Atoms or even the A900 headphones . The 55T tweeters are incredibly analytical and you hear everything, for better or worse. It’s easy to hear exactly where the tweeters are at all times and it intrudes on the listening experience. I suspect the front port tends to muddy the sound and perhaps this is what makes the 55Ts sound distant. It seems that the Monitor 55Ts are a contradictory speaker, being both analytical and distant. In terms of general sound signature, I found the 55Ts’ highs extend further than the Atom’s, the 55Ts’ mids more forward than the Atoms’, the 55Ts’ mid-bass recessed, and the bass more pronounced (where the Atoms’ small size is a serious disadvantage). Adding the 8” subwoofer nicely fills in the Atoms’ bottom end, but doesn’t seem to mesh as well with the 55Ts where there seems to be some interference. Full disclaimer: None of this particularly scientific. In the end, it is the Atoms that I find to be more musical and more natural, while the 55Ts pick apart everything with a fine tooth comb and seem very hard to please musically. The Polk Audio Monitor 55Ts perform much better as home theater speakers. I didn’t audition any specific movies or TV shows, instead electing to use them as I normally would. So far, I A/B’d the 55Ts alongside the Paradigm Atoms with Breaking Bad, Futurama, Lilyhammer, House of Cards, and some other shows then switched over to just the Polks for HBO’s Game of Thrones, The Wire, Silicon Valley, and Workaholics (via Amazon Prime ). For regular viewing, the 55Ts are rather transparent. Breaking Bad sounded nothing short of fantastic when reproduced the Polks with dialog easily heard and localized. The audio treatment of the show worked well with the Monitor 55Ts and even the music heard on the show – particularly in the scenes with Jesse’s crazy audio system – came alive. For some reason, the Polks just sound bigger when listening to TV and movies as opposed to the Paradigms where the audio loses its impact – or the “theater” of home theater. The analytical nature of the 55Ts especially came out in Game of Thrones; here the accentuated highs served up realistic clangs of the sword, and the larger cabinets were able to power through the battle scenes. Coupled with a subwoofer, the Polk Monitor 55Ts are able to deliver an immersive experience. I leave you with a rather obvious conclusion – only you can decide if the Polk Audio Monitor 55Ts are for you. Never purchase speakers without an in-person audition since everyone has their own unique tastes. With that said, I highly recommend the Monitor 55Ts as budget home theater speakers. The 55Ts will also serve most people well for music, but the discerning listener will want to look at other options if they will primarily listen to music.